We know that paddleboards are heavy, big and tough to carry. 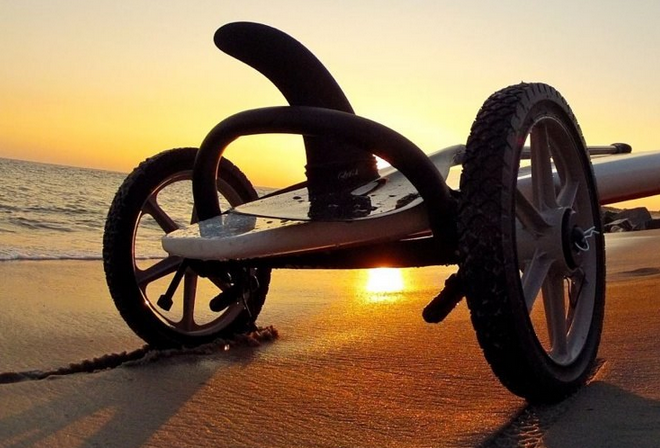 Give yourself a hand with a wheeled SUP carrier or paddleboard cart! SUP Wheels Classic: Saves you time & energy getting your SUP to the water! Its collapsible design is easy to take and use anywhere and it is built and tested to withstand harsh beach environments. An optional handle allows you to tow your SUP behind your bike. 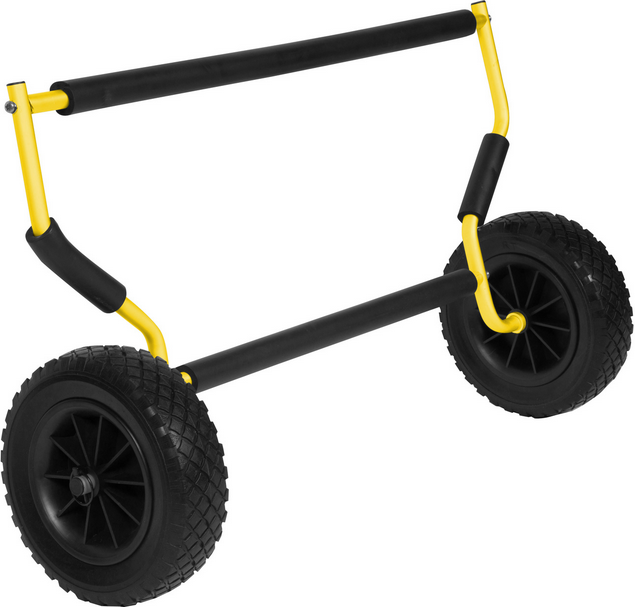 SUP Wheels has two 13.5 inch hard rubber wheels that will never go flat and can easily hop over curbs, steps, and more. Designed to be pushed or pulled, you can easily maneuver your heavy SUP over sand, grass, and pavement. SUP Wheels Evolution is everything that the SUP Wheels Classic is plus a mesh netting that allows you to hook in up to two paddles. This feature also includes a strap which allows you to carry all of your core SUP gear with just one hand! If you want completely hands-free transportation, then simply hook the tow handle around your bike seat. 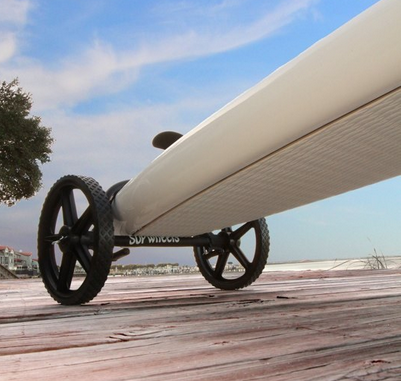 This will allow you to effortlessly tow your SUP paddleboard and paddle behind you to the beach or lake! SUP Dolly Cart: effectively a hand trailer that takes the majority of your board's weight and puts it on the cart. One of the big advantages to this type of SUP carrier is that is doesn't require tie down straps. This carrier relies on pressure to keep your paddleboard in the carrier, with thick Neoprene covered foam arms that your board rests on. These pads help prevent slipping and won't mark or damage your board's finish. The wheels on this cart are AIRLESS, which means they can never rust and never go flat! The frame of the cart is made from T6 6063 Aluminum and the hardware is stainless steel, so the entire cart is rust proof - a must for any quality SUP cart. The entire cart can be quickly and easily folded down for storage and transport.